Miranda Rodriguez, founder of Marketing Uninhibited, loves rabbit holes. She regularly jumps down them to advise businesses about marketing (as a word girl, I’m awestruck by people who voluntarily do this). 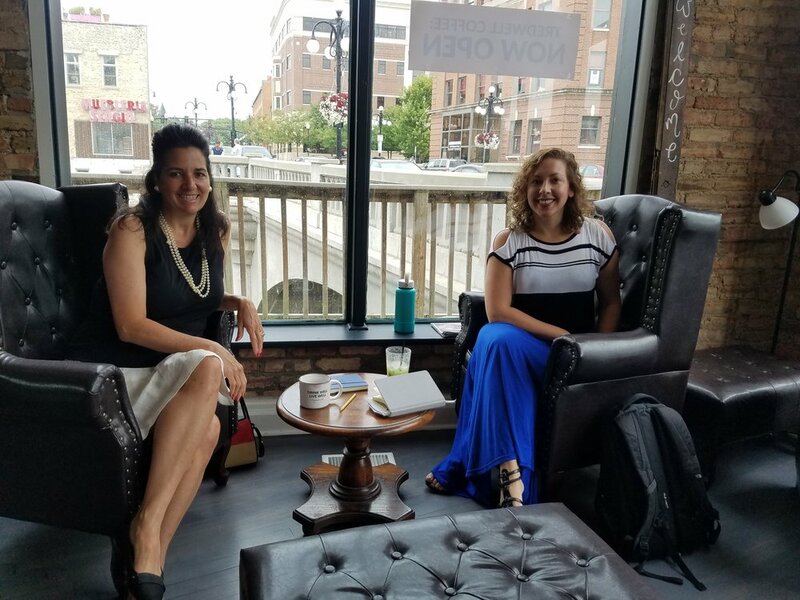 Miranda and I grabbed a couple leather chairs at Tredwell Coffee, a super chic hangout in downtown Aurora, right next to her office. We chatted up marketing like it was everybody’s top priority (and it really should be). As a writer, I know for fact that asking the right questions can mean the difference between flying down the highway and sitting roadside with a flat. So as Miranda started talking, I found her general conversational wisdom about brand and marketing absolutely fascinating. So I offered to write a blog on it. Here’s what she shared. Your to-do lists and goals are golden. Stick with them. This takes severe discipline (the kind my fourth grade teacher Sr. Monica demanded — strict and clear). Growth-bound businesses are overwhelmed. For example, networking is a goal that consumes a lot of time. So does blogging and social media and speaking gigs. Focusing on less with more effort gives more focused results (and keeps your sanity in check). You have to trust your marketing. Believe in marketing like you believe in your dog at the end of a bad day or your best friend from college who never let you walk home alone. No matter your marketing plan, you have to trust it will work. Marketing is a long haul. Frustration after a week is energy wasted. Give your brand strategy up to six months. Is our marketing strategy taking us in the direction we want to go? Recently, I was sharing with a client our desire to grow in 2019. He said to me, “Just saying you want to grow is a step toward making it happen.” Our exchange reminds me of Miranda’s point about vision: If you see where you want to go, you have a sound business. You’ll build your path. She says you have to be “unwavering” in what you want to accomplish. You might not know all the steps (that’s where Miranda comes in, so keep her contact information close! ), but keep going. While minutia is an important part of the process, the larger vision is just as important. I loved how she explained that when you understand the big picture, the little steps in between make a lot more sense. Do you believe, with 100% confidence, in your business mission? How do you find your brand confidence? Share your ideas here so we can keep the discussion going.